After breakfast, my brother and his wife departed and the rest of us headed down to the marina where Dad keeps his houseboat. We met a bunch of people in the tight-knit community of the marina, toured a bunch of house boats, and generally sat around and visited and swapped stories. 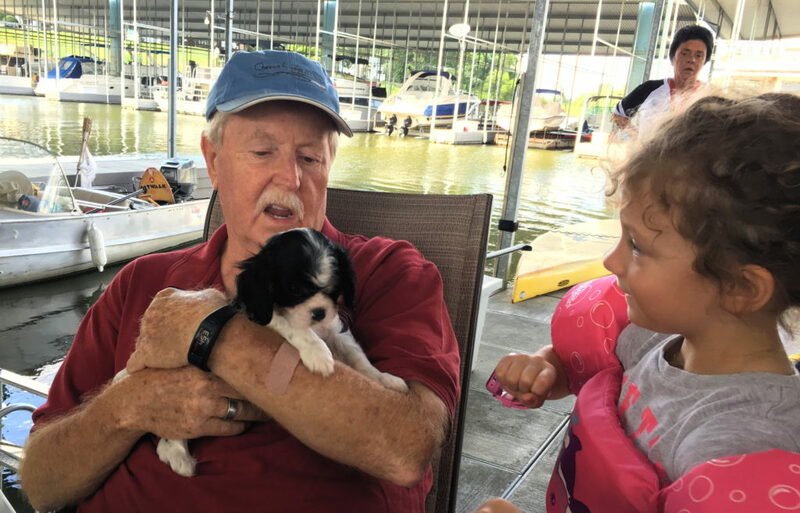 We puttered about a bit in a guys’ deckboat (a boat descriptor I hadn’t heard before), and played with a recently acquired six-week-old puppy! The marina was having a meeting of their board, punctuated with an honest-to-goodness catfish fry. I don’t think I’ve been to a real fish fry since I was about seven years old, so this was an extraordinary treat for me, and I ate an immodest amount of catfish and hushpuppies. Ahh, Southern bliss! Aiieee, my waistline! Because of all the people and festivities, I didn’t quite get the extended deep-and-real talk with my dad that I might have liked, but we enjoyed it nonetheless. 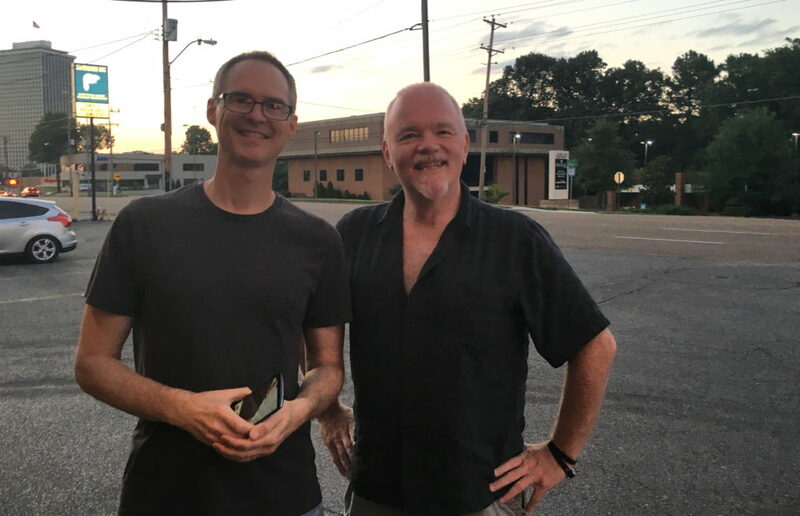 In an amazing stroke of fortune, my best friend from high school saw my recent posts about Memphis and it turned out he was also in town for the first time in about eight years, so we arranged to meet up for dinner. (My lord, all we have done on this trip is eat!) I met Lance and his eventual wife Lisa when we were all kids in junior high, and stayed fast friends through high school and at UT Knoxville. I hadn’t seen Lance in 29 (!!!) years, when he and his wife graduated college and departed for North Carolina. They are practically the only people I’ve stayed in touch with since high school, first through very occasional letters, then emails, and now from watching each others’ Facebook posts. We talked about where we all are in life today, I got the update on Lance’s three boys and Lance and Lisa’s career. It was fascinating to see small mannerisms that I so very clearly remembered from Lance as a teenager; the way he held his fingers to point at something at the menu, the tilt of his head as he listened closely. I also took a moment to say explicitly to Lance how much his and Lisa’s friendship meant to me in that time of my life, and how very much I needed and appreciated that. Now that I’m coming to terms with what can only be called my retirement, I’m embracing free time and travel in a big way and we will definitely be using that to visit Lance and Lisa in NC next year! We met and parted with enthusiastic and heartfelt hugs. For the first time on this trip, we got back to the condo well before 11 o’clock and had a relaxing evening to unwind. Monday morning is also currently unscheduled, and then we head to the airport mid-day. The last thing I will say before I close this little travelogue is how wonderful and amazing and delightful Melody has been. 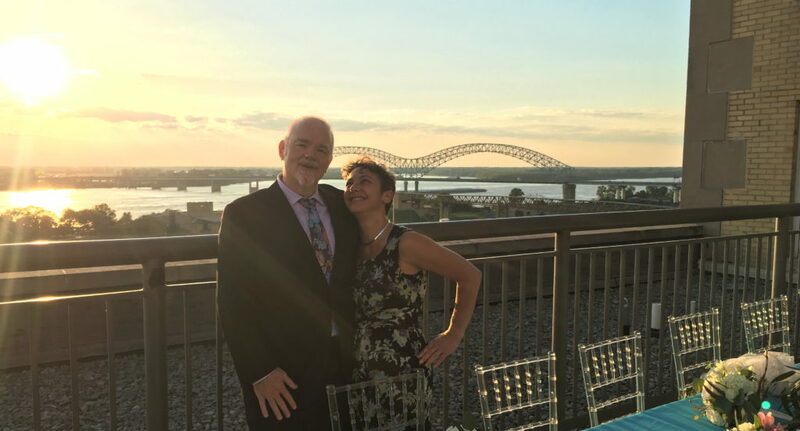 She has cheerfully been at my side every step of the way, meeting a barrage of total strangers, hearing endless stories of people she’s never met, fulfilling family obligations, taking photos, buoying me up, and looking effortlessly amazing while doing it. It is almost comical how many of my departing hugs with family members included being pulled extra close and told, “She is amazing!” or “This one is a keeper!” or “Don’t let her get away!”; I heard this from both of my brothers, my sister-in-law, my aunt, my dad’s partner, a cousin, the other cousin’s wife… Melody charms everyone she encounters. If I ever come back to town without her, I will not be nearly so warmly received. I am fortunate beyond measure to have her. She is my boon companion and my dearest love.